You are here: Home » Blog » Don’t use Solar Panels to off-set poor building practice. I was recently requested by an architectural practice to meet a client and explain the benefits of including a Photo Voltaic array (Solar Panels) on their new home. While the benefits from including PV’s were obvious, the reason to prioritise them above more fundamental investments proved more difficult to rationalise. The case is simple…. You must look at your consumption as well as your production and determine the most effective place to invest your money. 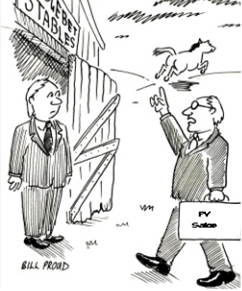 If, like many Australian, you include PV’s to offset energy use, particularly air conditioning costs, then you may be shutting the gate when the horse has bolted. There are four key steps that need to be undertaken before PV’s get on the menu. Good design that considers the operational effectiveness of the building. A strong knowledge of air tightness, thermal bridges, window quality, insulation, orientation etc. Quality materials and detailing that will retain coolth in Summer and warmth in Winter. Fit for purpose not for profit. A quality, professional and well versed builder who really gives a damn about getting it right. This approach will result in a quality, well designed and beautifully constructed home. A home that is warm and cool when it should be, quiet and comfortable to live in and eminently more valuable to anyone who may live in it in the future. The home works with you, free of charge, for as long as you live in it. Creating a structure that has the performance qualities of a colander just makes no sense. Offsetting the colander performance with 5 kW solar array which will provide you with approx. $5 (a cup of coffee) worth of saved energy each day just doesn’t make good commercial sense. Cut out one coffee, and invest from the start in getting it right. Choose the right people to help you make decisions and invest your money wisely. Your home is, after all, where you will spend half your waking hours. Poor air tightness will result in increased energy use. Residential energy modelling in Australia assumes 15 Air Changes Per Hour at 50 Pascals, while the EU average standard is 8.11 (Ambrose MD and Syme M, 2015)*. Air tightness is an important factor in all Australian climate zones to maintain comfort levels during summer and winter. Good air tightness means cool air won’t escape, hot air won’t enter, and the use of air conditioning and heating will be minimised. *House Energy Efficiency Inspections Project-Final Report. CSIRO, Australia.